The work plan is structured into five main work packages (WP2 to WP6) plus two additional work packages for project management (WP1) and dissemination and exploitation (WP7), see the figure below for a graphical representation. The former (WP1) will, in addition to standard management tasks, also concentrate on the technical management and coordinate the software engineering efforts undertaken in the other WPs, and the latter (WP7) goes beyond standard dissemination activities. 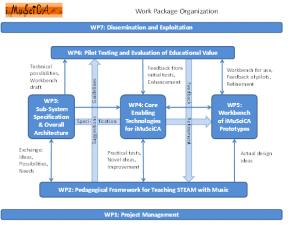 The work package structure of iMuSciCA ensures a good balance between the pedagogical aspects of STEAM (WP2) and the development of core enabling technologies (WP4) to be employed for STEAM learning. Moreover, resulting system specifications (WP3) will guide the development of the iMuSciCA workbench (WP5) which will be tested in real settings by an extensive pilot testing (WP6) in secondary schools with the involvement of teachers and students.